My recent move has taken me much closer to the wonderful Yorkshire coast and, even though it’s the middle of winter, I have had some lovely walks with Lucy, my dog. The way on to the beach at Hunmanby gap has some small gabions at the top of the beach. I think these are to break and filter the power of the sea, but they seem a little small to my inexpert eye. They do provide a little inspiration and I may produce a small series of pieces related to coastal protection. At this point in the year, after recent record rainfalls, there is more chance of coastal erosion especially along the clay cliffs here locally, the rain running rapidly off the land is constantly washing down chunks of cliff. I have had a very exciting few weeks. It has involved moving house and studio. Moving house was relatively simple but packing and unpacking my studio felt like a major undertaking. I am happy to say everything is now in its new place and i have begun work on a few new ideas. I will miss the moors but am now very close to the beautiful beach of Filey bay. I am so looking forward to welcoming students to my new studio and ready to begin teaching again in the new year. Best wishes for 2016 everyone! 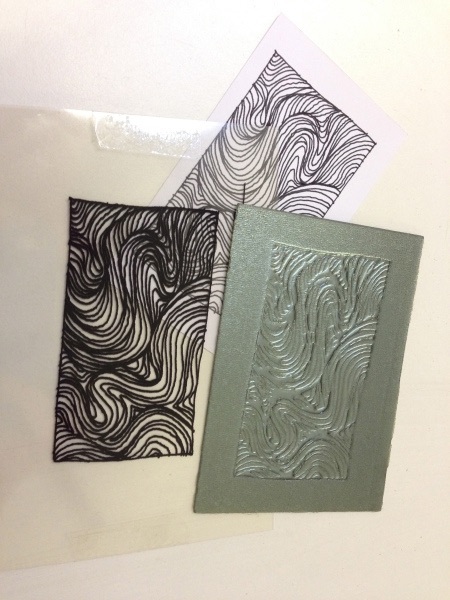 I regularly use photopolymer sheet to make my own textures for using with metal clay. it is available in a number of thicknesses and also with either a plastic or metal backing. I have a slight preference for the metal backed version although it is easy to cut the plastic backed version yourself with scissors and the plastic backed version is also flexible. To make your own you need a UV light source, photopolymer sheets, line drawings printed onto transparent sheet a small clip frame i.e.. glass, backing and a bit of white card and some metal spring clips, a soft nail brush (you can buy a specialist sponge for washing the plates). Check that it fits inside the light box before you start. I begin by printing two copies of my line drawings onto overhead projector sheet and then very carefully tape the two layers together to make a double thickness transparency with quite dense lines. Make sure you line the layers up really carefully. Unwrap your piece of light sensitive photopolymer sheet and remove the thin protective layer (wrap any unused sheet back up in black plastic straight away). Place the transparency onto the photopolymer sheet and put it on a small sheet of white card on top of the back board of a clip frame. Place the glass on top and clip the layers together so they are held firmly against each other. Remember that the black areas and lines are the areas that are washed away and if you are using text you will want the finished plate to have the text in reverse. Place it in the UV box and switch on – you may want to do a test piece first by covering most of the sandwich with a card and drawing it out a little every five seconds, so that you have even segments of your test piece with different exposures. Then when you wash, dry and finish the plate you will know the best exposure time for your set up. I know that mine works best with an exposure around 25 seconds. Set a timer so that you know you are making consistent exposures. Do NOT look into the UV light. Mine is a UV nail box but you can purchase a professional version if you really like using this technique. Once the exposure has been completed take the photopolymer sheet out of the stack and wash it gently in hot water. I use a very soft natural bristle nail brush but you can get a special sponge from most photopolymer suppliers. Be careful not to over wash your plate at this stage. It will be tacky so dry it thoroughly either with a hair dryer or in a dehydrator. You can wash it right down to the backing plate but I generally prefer not to. Then re-expose your plate in the UV light box without the glass this time. I usually give mine a minute. This sets the areas that weren’t exposed the first time. Remember to lightly brush olive oil or release agent over your sheet before each use and I keep them wrapped in acid free lightly oiled tissue paper in a box when not being used. If clay does accidentally stuck into your plate you can give the plate a gentle wash and dry to clean it up. 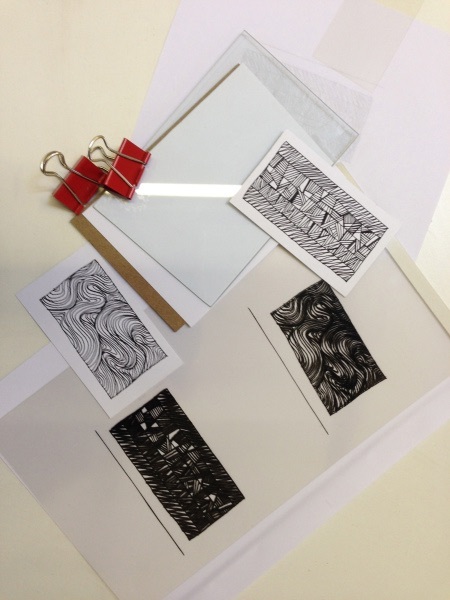 I hope you enjoy creating your own unique texture plates – they can of course be used for printmaking too! I was invited to get back into the blogging world by my friend Anna Mazoń though the Around the World Blog Hop. This is kind of like a chain letter between artists, artists blogs link to each other and share their processes and thoughts. I will try and follow the questions and headings as best I can. I’ve enjoyed reading Anna’s blog and was thrilled to meet her in person when she agreed to teach in my studio in May 2013. It was an astonishing few days and really changed the way I worked with the silver clay, although I doing remember saying something like ‘you must be joking, I can barely see them let alone make something like that’. The way Anna creates such tiny details is amazing, I think everyone who came to the workshop was inspired by her and it was so special being able to spend time with her and form a proper friendship. I didn’t finish my piece during the workshop, I was mostly kept busy being the host, but did finish it afterwards and it is now owned by one of my friends. I do create work using a variety of different media and techniques, not solely metal clay. I also teach jewellery making classes here in my lovely studio on the North York Moors. I have decided that during 2015 I am going to put a bit less of an emphasis on running workshops and give myself a bit more time to explore and learn some new techniques. I am always happy to do a workshop on a one to one basis by arrangement, so if you think of something you’d like to do here please just get in contact. Within my own work I am planing to create a series of little buildings and also practice different stone settings. I’m also experimenting a bit more with mixed metals and planning to do some forming and raising. I would say the most challenging thing I’m working on has been trying to create a little version of the Tempietto. It is based on a small piece of renaissance architecture by Bramante and was all about geometry and proportion. It has 16 columns and the height of the building should be equal to its diameter on plan. As you can see this is my second attempt (so far), the proportions are still not quite right but I’m quite happy with the way it turned out. It was constructed of lots of tiny parts, dried and then joined before firing in the kiln. I am planning a series of pieces loosely based upon buildings I have visited. I used to teach history of architecture & design at degree level and have a huge back catalogue of photos of buildings to draw upon for ideas. I’m also working on a series of pieces of enamelled jewellery, simply enjoying combining colours and setting them into heavily oxidised sterling silver. The photo above are some of the pieces of enamel waiting for their settings to be constructed. It may be some time until they’re finished as once the settings are made they will be sent for hallmarking before the enamels are set into them. The earrings above are a pair I completed in December when I was trying out the idea. When I first started enamelling I used to bezel set everything but haven’t done anything like that for a few years now so it’s good to get back to this. The Precious Land Necklace was part of a series of pieces created for the final project of my MA in 2004 and inspired by the textures and patterns of the moorland landscape. One of the questions of the blog hop is how does my work differ from others of its genre? I’m finding this one really difficult to answer. I think, like many makers I’m inspired by the landscape, whether that be my home environment of the North York Moors or the urban environments I visit on days out and holidays. Sometimes the inspiration will be very directly translated as my little pieces of architecture, but others times it will just come from a flash of sunlight on the hillside or a bit of texture in the coastline. I don’t really see myself as working within one consistent series of pieces of work either. I create what I do because I have to. I have always made things and it keeps me happy. These days it also helps me stay involved with the world around me, particularly through contacts and friends I have made while exploring enamelling and metal clay. I began enamelling as a hobby in 1999. At that time I was teaching history of architecture and design theory at undergraduate level. I bought a small kiln and a starter pack of enamels and tools and was immediately captivated. I do remember my Dad doing a little bit of enamelling when I was in my early teens but don’t really remember taking any interest in it then. As I did more enamelling I quickly realised I would need to learn some metal work and jewellery making techniques and while I am mostly self taught I did join the Guild of Enamellers and have been able to attend a number of conferences and regional meetings over the years, learning from some incredible people and making some great friends. For most of my pieces I start with an idea in mind. Sometimes it is continuing a theme or narrative and sometimes like with workshop projects the focus is a technique. I usually begin with a conceptual sketch and notes, which can develop into a template for a base structure. The bird with the large fan shaped tail is based upon one inlaid into a gunstock in Whitby Museum and the one at the bottom of the right hand edge was an object in the British Museum and became the basis of my bird brooch. This dates to around 2010 when I was fortunate to be artist in residence at Whitby Museum, a place that continues to be a source of inspiration for me. It was through a workshop at a Guild of Enamellers conference that I was first introduced to art clay silver, a fantastic medium that enables me to construct 3D forms and create wonderful textures that would be difficult for me using mo traditional techniques. If you want more information about art clay silver there are plenty of resources online and some very talented teachers offering classes. I usually buy my materials from Metal Clay Ltd here in the UK. Their website has lots of information about the products. Like enamelling, the metal clay community is a very friendly and creative one. Being part of it has given me the opportunity to learn from International artists and to travel to Japan to visit Aida Corporation where Art Clay Silver and Copper are made. It also means that when I am trying to work out the best way forward in a project there is always someone I can phone to chat and go over an idea. One of the friends I regularly call upon is the very talented Lesley Messam. She is a fantastic metalsmith as well as having achieved Level 4 in the Metal Clay Masters Registry. She is always encouraging me and it’s great to be able to call upon her experience and to share ideas. Next Up in the Blog Hop is another good friend Joy Funnell. We were both in the same group at the Guild of Enamellers conference where I first tried art clay silver and went on to take our certification courses together. I hope she likes that I’ve included some of my most colourful pieces in this blogpost. Her work is usually much more colourful than mine. At this point in the year I take a bit of time to learn some new techniques or practice a particular skill. I have decided to do some stone setting. I have quite a few interesting cabochons stashed away in a box and, although I used to set my enamels in bezel settings it is some years since I did this. Today I have made myself a ring using a very rounded rutilated Quartz cabochon that has been in my box of bits for many years. I oxidised it very heavily and this reflects in the inclusions and makes them appear more of a contrast with the rest of the stone even though they are actually quite pale. On Saturday I spent the day helping Jodie and Dave make their wedding rings. This is a one day workshop I run by arrangement and it is always very enjoyable. We discuss the profile, work out sizes and begin to make the rings with me demonstrating techniques, step by step throughout the day. This exhibition will show work by myself, Stef and Kimberli all inspired by aspects of the North Yorkshire landscape. Being involved in this has pushed me into producing new work unlike anything I have done before. I am looking forward to seeing it all come together today.